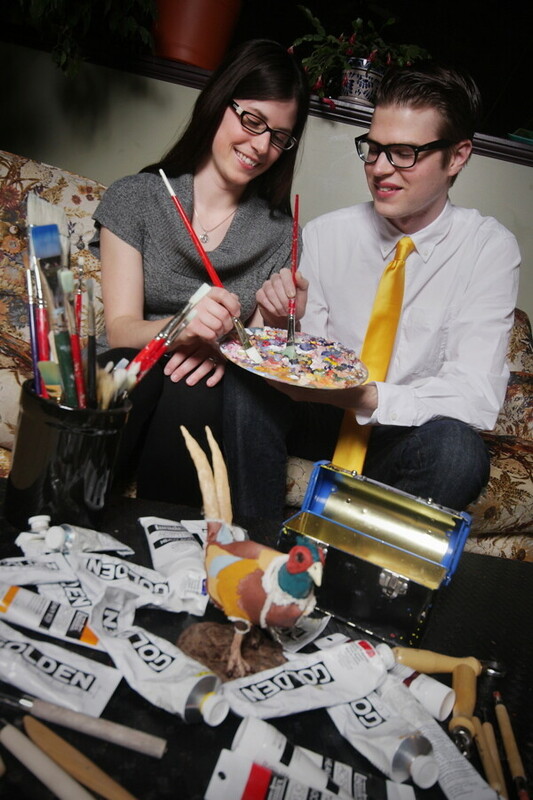 Erik Christenson and Anna Kaiser met at the Minneapolis College of Art and Design during their freshman year. Flash forward seven years and the newly engaged couple are living and working as graphic designers – Erik at Menomonie’s Big Dot of Happiness, Anna at Documation in Eau Claire. Each totes an impressive résumé. They’ve both done design work for Nickelodeon, Anna has illustrated for children’s and coloring books, and Erik has designed for Picture Window Books and Urban Threads – not to mention they’ve each also had works featured on the cover of Volume One. Working in a shared space probably doesn’t hurt, either. The duo has transformed their upstairs into a studio – they each have their own side – for their freelance work. Though many artists prefer to work alone, the couple said they enjoy having the shared space because working together helps push them to create.